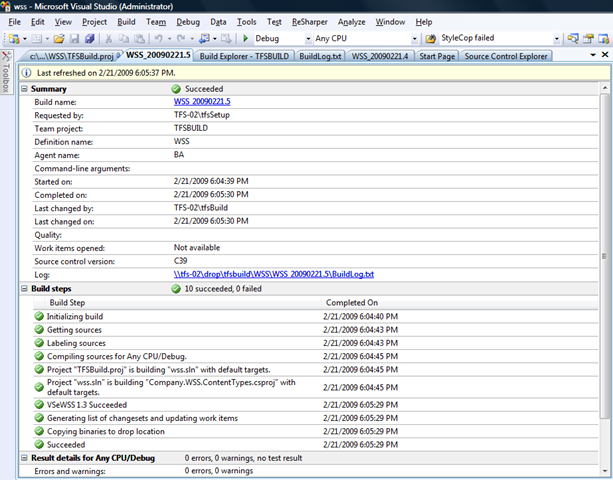 I couldn’t wait to try out the latest VSeWSS 1.3 CTP due to the fact I could not get the January 2009 CTP to work properly with Visual Studio 2008 SP1 on Windows Server 2008 Standard Edition (x32) and MOSS 2007 SP1, let alone Team Build. After you install the February 2009 CTP you might find that you get an error which is due to the fact that the application pool must be recycled for the Central Administration Site. The identity for this pool must also be a member of the local administrators group. VSeWSS Service Logging Error: Access to the path ‘Microsoft\VSeWSS 1.3’ is denied. Logging failed attempting to write to Microsoft\VSeWSS 1.3\VSeWSS1.3 service.log. This may occur because the VSeWSS WCF Service does not have local administrator permissions. Please review the release notes. If you have verified that the identity is a member of the local administrators group then perform an IISRESET at a command prompt after which VSeWSS 1.3 will work properly. Message="VSeWSS 1.3 build step is executing." Condition=" '$(IsDesktopBuild)' != 'true' "
You could have also been running a desktop build from a Visual Studio Command Prompt to make sure all is well before you check in the tfsbuild.proj file. 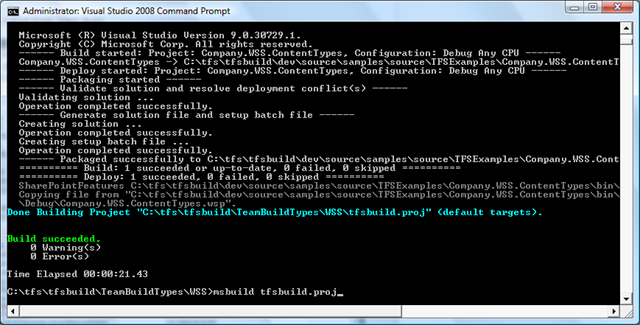 Editing the tfsBuild.proj file can be made a bit easier with a great tool called Team Foundation Sidekicks, it has a Build Type Editor extension on the Build Project right click. This allows you to check-out and edit then check-in with fewer clicks. This is a great add-on to Visual Studio which after a while you’ll wonder how you lived without it. Tried your code and it worked perfectly! One thing tho – how do we copy the setup.bat files to our release folder? i guess we even have to rename them on copying, or else they will just be overwritten? (in case of several projects in one soluion). Should we change to AfterCompileProject ?